Turnout across the whole of the UK at the 2010 general election was 65.1%. This was up almost four percentage points on 2005, but a fair way below the 78.8% seen in February 1974, which remains the highest turnout of any general election in the last 60 years. I would anticipate turnout this year to be higher than in 2010. It might not up that much, but my instinct is that the uncertainty over the outcome, combined with the rise in support for the SNP, Ukip and the Greens, will push turnout nearer to 70%. The number one seat of Renfrewshire East is the constituency of Jim Murphy, currently Scottish Labour leader. It’s a very safe seat and Murphy won over 50% of the vote in 2010. But the likelihood of turnout topping 80% at this year’s election has to be strong. Murphy is now a big name in Scotland and is likely to attract an increase in support both for himself and his rivals – especially the SNP. Second in the list is Westmorland & Lonsdale: the seat of Liberal Democrat president Tim Farron. Again, it’s a very safe seat, and Farron won a massive 60% of the vote in 2010. But I’m not sure turnout here will go up. Farron will hold the seat, but the decline in support for the Lib Dems across the UK may depress interest, despite the added presence of the Greens who didn’t stand in this seat last time. It’s interesting that of the 10 seats that saw the biggest turnouts in 2010, only two were marginals: Richmond Park and St Albans. Richmond Park was also one of only two seats on the list to change hands, in this instance being won by Zac Goldsmith for the Tories from the Lib Dems. Goldsmith currently has a majority of 4,091 and will hold the seat comfortably. I suspect this might mean Richmond Park drops down the list of biggest turnouts in 2015, though it may still make it into the top 10 by virtue of its constituents’ historically high record for participation. The other seat on the list to change hands was Winchester, which was also a gain by the Tories from the Lib Dems. This wasn’t a marginal in 2010, however, and the Tories took the seat on a massive 9.1% swing. The other marginal on the list, St Albans, didn’t change hands in 2010 but the party in second place behind the Conservatives changed from Labour to the Liberal Democrats. I’d expect this to change back this year. Four of the seats on the list were newly created for the 2010 election: Devon Central, Somerset North East, Kenilworth & Southam and Thornbury & Yate. I don’t think any of the seats in the top 10 from 2010 will change hands this year. 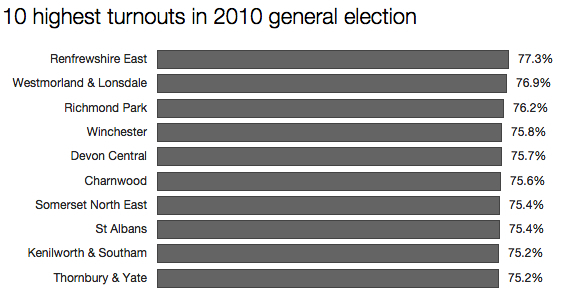 A good few might not make it into 2015’s 10 highest turnouts. But I wonder if there’s a chance Renfrewshire East might come top once again. It’s got a high profile figure in Jim Murphy, the prospect of a strong though almost certainly unsuccessful SNP challenge, and a good record of participation (the seat was also in 2005’s top 10). Even if Murphy presides over a disappointing result for Labour overall in Scotland, he might still be able to boast of an impressive feat in his own backyard.